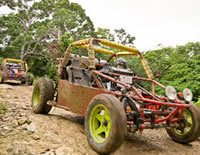 Tour the historic hills of Rose Hall behind the wheel of your very own custom made tubular framed Chukka Dune Buggy. After being fitted with your helmet and secured in your "sports utility vehicles", shift into drive and head off through lands once roomed by Annie Palmer, the White Witch herself, managed her estate by day and met her many lovers on her famous mid night rendezvous. Traverse the once thriving sugar plantation where she ruthlessly ruled with an iron hand and drove fear into the hearts of her slaves. Visit the old ruins where sugar was once processed, before showing your driving skills as you negotiate the curves and turns that lead you to breathtaking views 700ft above sea level, overlooking the world famous White Witch golf course and the picturesque Caribbean coastline. Dusty, muddy and ready for more adventure, change gears to cruise through small communities, then prepare for your non stop drive back to the base.